Diyarbakir, biggest city in the Kurdish southeast of Turkey, is remarkably quiet these days, while in Istanbul, Ankara and Izmir the police are violently attacking people who are peacefully using their democratic right to assemble and demonstrate. Why are the Kurds not flooding onto the streets to join the protests against the government? They are demanding liberties too, aren’t they, so why don’t the Kurds rise up together with the Turks? In short, I think that is because these protests against the government are not their struggle. The struggle of the Kurds started in 1984, with the violent campaign of the PKK and the awakening of Kurdish consciousness among the people that resulted fom it. For Kurds, authoritarianism and suppression are nothing new. Ever since the foundation of the Republic, in 1923, they have got to know the state, subsequent governments and their methods of cracking down on dissidence. The protesters in Istanbul (and Ankara and Izmir and several other cities, but I’m not going to mention them in the rest of the post for readability reasons) are, you could say, catching up with that now. It’s amazing to see the bewilderment among the protesters about the behaviour of the police and the lies that the main Turkish media spread, and to notice their utter frustration about being depicted by Prime Minister Erdogan as thugs, marginal groups and pillagers. Let me elaborate. The police are not only using excessive amounts of teargas, but also aiming the canisters directly at people, wounding many. Turkish media do report about the protests, but in exactly the way Erdogan wants: trivialize it, not showing police violence, and giving lots of air time to Erdogan and other AKP spokespersons and not a minute to the protesters. The frustration about being called thugs and pillagers gets even deeper when you know that Erdogan’s followers actually believe their leader. How are the protesters ever going to convince AKP voters in smaller Anatolian towns that what the TV shows and what Erdogan says are lies? That is all so utterly familiar for Kurds. They live with all that, and have experienced far worse in the past. Say ‘Kurds rising up’ and it starts as early as 1925. 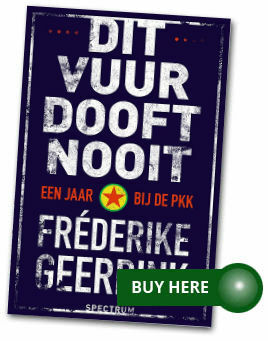 That was not a nationalist Kurdish uprising but one aimed against secularisation and the abolishment of the caliphate, but the new state showed immediately how uprisings wouldbe dealt with from now on: extreme violence and hanging the leaders. Several smaller uprisings after that were treated in the same way. In 1937 and 1938 not even an uprising was needed to brutally kill tens of thousands of Kurds: the Dersim massacres were plainly aimed at crushing Kurdish identity, and were initiated and monitored by the authoritarian leader Turkey had in those days: Mustafa Kemal Atatürk. That would be comparable to, let’s say, Erdogan’s government sealing off Izmir province from the outside world, introducing martial law, rounding up secularist leaders and just any man, woman and child and killing them. The survivors of Izmir would be resettled in small groups in towns where mainly religious people live, so their fierce secularism would fade out in time. Every government that has lead Turkey since the last Kurdish uprising started thirty years ago has suppressed it with violence. Not only were they fighting the PKK, but the people too. Extra-judicial killings, mass arrests, torture, disappearances, denying their culture and even their identity, you name it and Kurds have experienced it. And Turkish media have either not reported on it at all, or framed everything as terrorism. And the interesting thing is: Turks have believed the lies. They have been taught by the state system and the media to call the PKK terrorists, and to regard every act of violence against Kurds as the justified handling of terrorists and separatists. Most Turks have as a result never been willing to open their eyes to the realities of Turkey before, for example by following Kurdish media or visiting Kurdish areas. And now, the ones protesting are shattered by what they experience. The media are lying! We are no thugs! We just want our identity! What a harsh wakeup call. Will the wakeup call bring the protesters closer to Kurds? I have to say I doubt it. However diverse the demonstrators in Istanbul are, they have something in common: they want Prime Minister Erdogan out. That’s the most important and most widely voiced demand, which is something totally different to what the Kurdish movement demands, which is a transformation of the state. 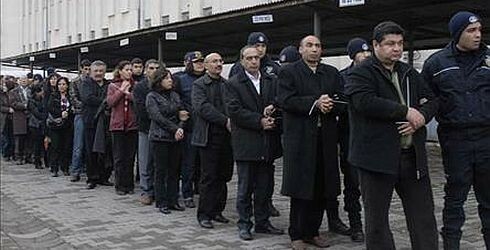 The state that is sacred for not only a few of the protesters in Istanbul. Fierce opponents of Erdogan are often strongdefenders of Atatürk’s Kemalism, the Turkish state ideology that got the Kurds into trouble in the first place. Actually, the longer the protests last, the more Atatürk flags, T-shirts and portraits I see on pictures of the protests. When I hear them demand the freedom to live their lifestyle even though Erdogan hates it, I struggle not to get cynical. 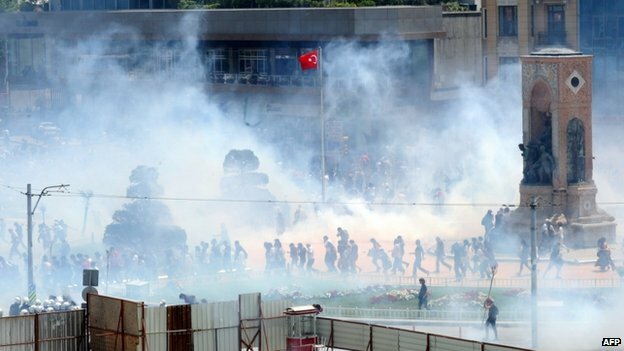 But does all this mean the Kurds don’t support the protesters on Istanbul’s Taksim Square? Not at all. All the Kurds I spoke to in the last few days in Diyarbakir (in a bakery shop, in a park, in a tea garden and at the head office of BDP) gave their support. Some were bitter about the lack of Turkish support for their struggle and a lack of sympathy for the pain they have experienced, but, as one man formulated it: ‘We are on the side of the people’. Support meeting in Diyarbakir, Saturday 2 June 2013. Pic by Elif Akgül. 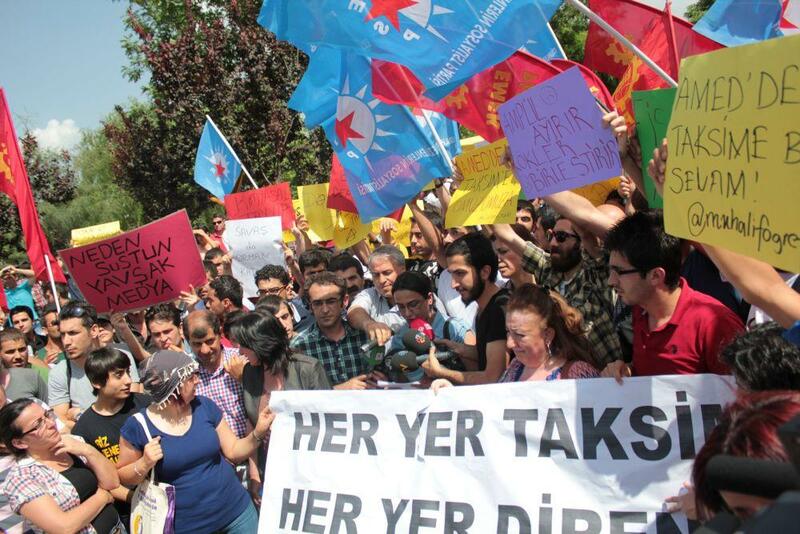 As well, a march of support was held here on Saturday, and also in Mardin, Van, Agri and other towns. Some 1,000 to 1,500 people showed up, they marched to a park and both Meral Danis Bektas (a Kurdish MP) and a union leader gave a press statement. All nicely planned between 2 and 3 pm, and that was that. A symbolic support meeting, not a spontaneous flooding to the streets, not the start of Kurds joining the Istanbul spirit. It was a step outside of their own big and strong resistance movement. Kurds don’t join the Turks in their protests, because they are in a strong, well organized movement already. They are experienced in rising up, in formulating their demands, and in finding strategies to realize them. They have come a long way and have a long way to go. How could they get fired up by such a very fresh awakening in Istanbul? Very telling was a slogan I saw Saturday in Diyarbakir (whose Kurdish name is Amed): ‘A thousand greetings from Amed, the castle of resistance, to Taksim’.